I had spent the day driving three hours to a funeral near Jackson, Mississippi and visiting afterward at a large gathering of family and friends. I was driving back home when, just as the sun had set, my phone rang. 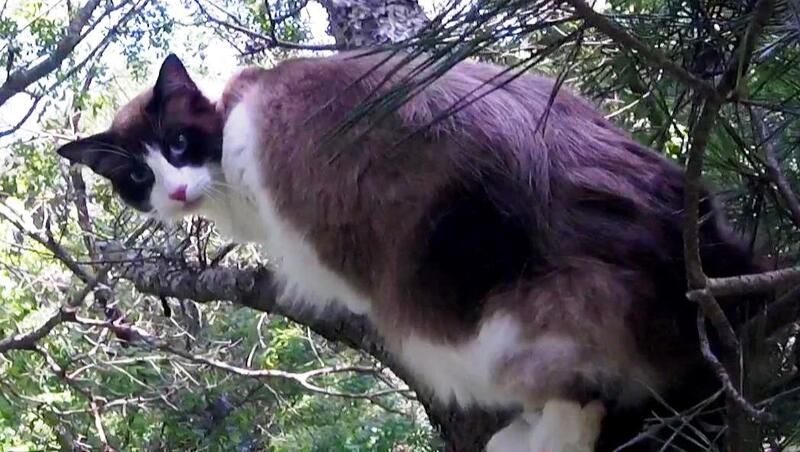 Brittany was calling to see if I could rescue her Snowshoe cat in a tree. Just minutes earlier, Brittany learned from her neighbor that there was a cat in a tree at the far back end of his backyard. Brittany's cat, Marshall, had been missing for three weeks, so she immediately rushed over there to see if the cat could possibly be hers. She quickly recognized him and was thrilled to find him at last, but now she had a new problem: how to get him down. Brittany' sister, Shawn, had had a similar problem a few years ago, so Brittany called her. 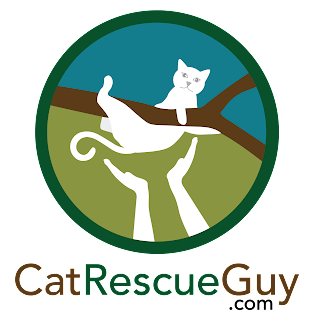 As it turned out, I had rescued Shawn's cat, Ringo, more than two years ago, and Shawn still had my phone number on hand. While I have rescued two cat siblings before, this would be my first time to rescue two cat-owner siblings. Brittany had been distressed about Marshall ever since he disappeared three weeks ago. She had raised him since his birth a year ago and given him a sheltered life inside her home. He was not smart about outdoor life and the dangers to be found there. Even though he was now not far from home, she doubted his ability to find his way back home if he were to come down or fall out of the tree. Brittany would learn later that other neighbors had noticed him there in the tree three days earlier. 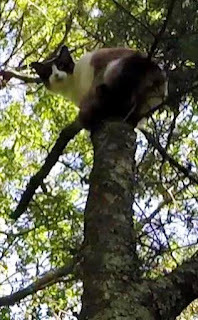 It was unlikely that he had been stuck in the tree for the entire three-week period that he has been missing, but we did know he had been stuck there for at least three days, including a severe round of thunderstorms, and Brittany wanted to get him down right now. Marshall was only 15 feet high (yellow circle in picture) sitting on top of the trunk where a large branch had broken off long ago. Brittany's husband brought a ladder over and was perfectly willing and capable of getting Marshall down, but as he placed the ladder into position, Marshall got scared and climbed up much higher and well out of reach. While Brittany was telling me all of this over the phone, I was weighing the arguments for rescuing him right away this night or waiting till morning. I could hear how desperate Brittany was to get her baby down now, and I was also worried that Marshall would not know where to go if he fell out of the tree overnight. 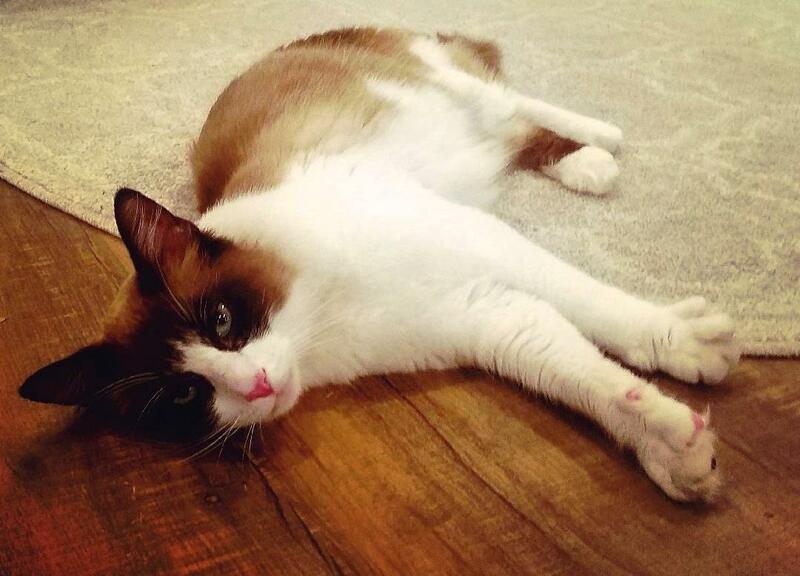 He has been missing for three weeks, and now we know where he is. I did not want to miss this opportunity and risk letting him slip away again. However, I was still at least an hour away from home, so I could not get there until after 9:00 PM at best. 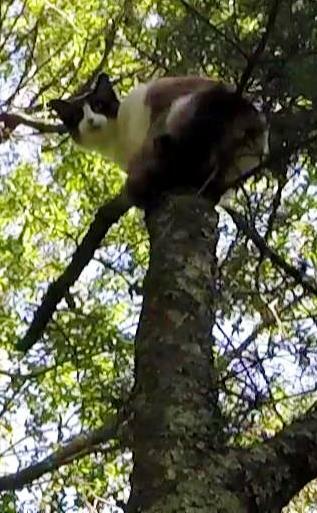 While Brittany described Marshall as a very friendly and docile cat, I was concerned about how he got scared and climbed higher in the tree when even his own recognized human dad tried to rescue him. I was pretty sure I could expect the same reaction when I was the person approaching him, and darkness is not the best time to be trying to go to the far reaches of a tree. I needed to be able to see the tree well in order to know where I could safely place my rope. I was also concerned that the bright head-lamp I would have to wear would spook Marshall even more. If this were an easy rescue in an easy tree, I could do it, but I was already tired from the long day and didn't think it would be wise to start a difficult rescue that way, especially in the dark. I had reservations about my decision, but I arranged to meet Brittany there the following morning. Shortly after daybreak she let me know that Marshall was still there, and we were both relieved. When I arrived, Brittany led me to the site at the far end of the neighbor's backyard. The tree, which was on the edge of a large ditch, had seen better days but was still very much alive. All the growth was on one side since it appeared that the large branch that supported all the growth on the other side had broken off long ago. I was pleased to see that, sometime during the night, Marshall had somehow managed to climb back down to his original perch just 15 feet high. If he would stay there, then this could be an easy rescue after all. To set my rope in the tree, I needed to shoot my weighted bag over the large crotch just a few feet above Marshall. This would be a super-easy shot since the target crotch was fairly low and had a large, wide opening. But like I can often miss my target when throwing something into the garbage can only one foot away, I missed my shot. Instead, the weighted bag slapped clumsily and noisily into one of the branches and dropped down uselessly from there. Not surprisingly, this scared Marshall, and he responded by climbing up higher and higher. He eventually stopped on a precarious spot about 40 feet high, circled in red in the picture above. This tree did not have any good places up high where I could set my rope. I picked out the only limb that was substantial enough to trust, but it would get me only as high as Marshall. If he climbed any higher, I would not be able to follow him. This was a harder target to shoot, but I got it on my first shot and installed my rope there. Fortunately, Marshall stayed in place. 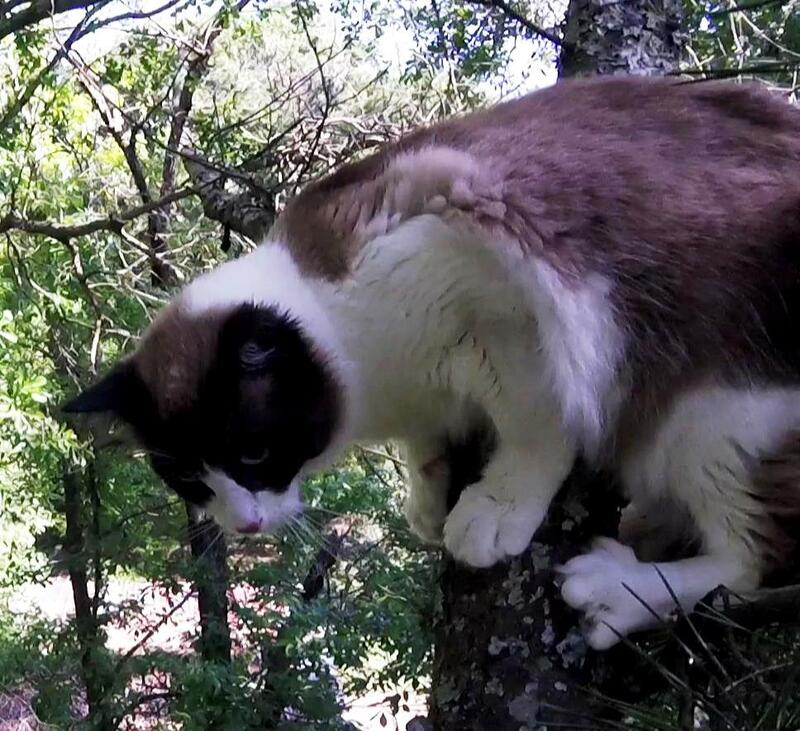 I climbed up to him slowly while being careful not to do anything that would scare him higher. He watched me as I approached, and I could see that he was concerned about me, but he was also afraid to go any higher. I slowly climbed up as high as the rope would allow, and I was now level with Marshall and an arm's length away. He was a little stressed with me there, so I wanted to calm him as quickly as possible. I reached out to let him sniff my hand, but he was wary at first. I needed to break the ice quickly so he would not climb away from me, so I took a risk and gently touched his back side. I pulled my hand back away to let him know that was all I was doing. I reached my hand out to him to sniff again, and this time he sniffed. I touched his back again and gave him a few friendly scratches. He seemed to be calming down now, so I decided to seal the deal by opening a can of food. He was definitely interested in the food, and he readily took a bite. He was even more relaxed now, so I was beginning to relax a bit too. I continued to touch him and pet him and give him bites of food to build on our new relationship, and it all went well. I put the food in the back of the carrier and held it up to him to see if he would walk inside, but he would not do it. I put the carrier away and prepared the gloved bag. Again I offered him some food and got him more comfortable with my touch on his scruff. When I felt he was ready, I grabbed his scruff, picked him up and pulled the bag over him. He complained a little bit, but he did not struggle. This kitty was finally in the bag. I brought him down and gave him to Brittany. She took him home and released him there. After I packed up, I went to her house to get my bag and to see them before I left. Marshall looked great. He was walking around, and he greeted me while purring. I petted him some more, and he walked off clearly happy to be back home after his three-week adventure. He came back to me again, still purring, and brushed up against me again. He is a super-sweet boy, and I am so glad to see him back home again. The video of the rescue is useless since the camera got bumped out of position. There were some moments when Marshall was in the frame and I was able to grab a few still images there, but most of the time, he wasn't. Fortunately, Brittany sent this picture of him to me after I left.